Towards Re-peripheralisation in Australia, Canada and Mexico? International trade must be analysed within the historical context within which it occurs. Behind the statistics on trade flows lie power structures, class interests and international hierarchies. These change over time and how countries respond to them has critical implications for their citizen’s well-being. 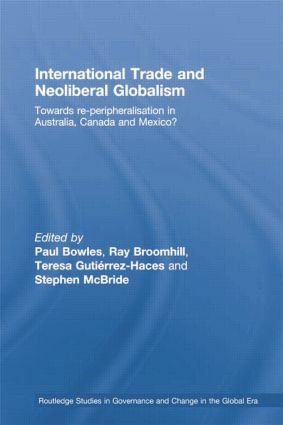 In this book, the history of trade in Australia, Canada and Mexico is analysed. Trade agreements are analysed in detail to explore the new forms that dependence and subordination have taken. Arguing that the free trade agreements are significantly biased in favour of the United States, the contributors analyse how each of the three countries are being subject to specific forms of re-peripheralisation and examine possible alternatives for a progressive future based on an integration in the global economy which enhances, rather than limits, democracy and social justice. By providing an historical and critical account of trade policy in the three countries, the book provides a welcome antidote to the ahistorical accounts of free trade supporters.